Despite not always being the most interesting features at an event, chairs are always important, no matter if you’re hosting a wedding or corporate event. There is a way to make chairs that little bit more special, however – chair cover hire for your Sydney event is a great way to add a bit of simple personalisation that can go a long way. The huge variety of chair cover options means that whether you have an indoor or outdoor event, your chairs can turn heads while still being as reserved or colourful as you’d like. For additional decoration hire, we also provide chair sashes for hire, adding even more colour to your chairs. At Bespoke Social we make sure to provide a variety of chair cover materials so that any situation is perfectly catered for. 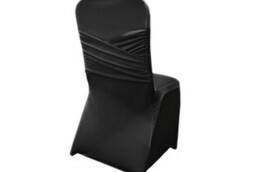 We feature three different types of materials used as chair covers: satin, lycra and matt, ensuring that any taste, circumstance and budget can be appropriately catered for. These materials are also offered in a huge variety of colours, meaning that customisability does not need to stop at materials. While our satin and matt chair covers are offered in classic colours like black, white and silver, our lycra range is available in beautifully bright colours like pink, red and blue. Our options mean that no matter your taste or the occasion, our chair cover hire will go a long way to emphasise your personality and the theming of your event. If you would any more information about how chair covers and chair sashes can be incorporated into your event, make sure to get in touch with us. We can better illustrate the benefits of the different materials we stock, and are more than happy to help you out with colour combinations. To get in touch, you can ring us on 02 9982 6705, or alternatively you can send a message though our online enquiry form and we will be sure to reply as quickly as time permits. We look forward to giving your special event a touch of uniqueness!